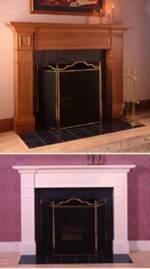 Home / Home Improvement / Fabulous Fireplace Surround Woodworking Plan. Fabulous Fireplace Surround Woodworking Plan. 31-MD-00219 - Fabulous Fireplace Surround Woodworking Plan. This beauty will add sizzle to your homes interior. Here is one home improvement project that is as attractive and fun to make as any piece of fine furniture. Interested? We think you will be surprised by how easy it is to construct, and by how you can tailor its look and size to suit your homes interior. The surrounds size is adjustable. If staining use a wood of your choice, if painting use MDF. A full materials and supplies list is included with the plan. Tablesaw, table mounted router, clamps, belt sander, and common hand tools.